Form Description: This form will help you track your or your employees' mileage for tax, budgeting and reimbursement purposes. Includes space for employee contact and department information and individual trip information. The section for mileage itself includes columns for the date of the trip, the starting and ending address and odometer, and the total miles. This form is in one-per-page landscape format. You can download a PDF version of the "Mileage Report" form absolutely free. You can also, for a small payment, download a fully editable version of the form that you can customize as you desire. (Don't know which format to choose? Here's how to make your choice.) What would you like to do? 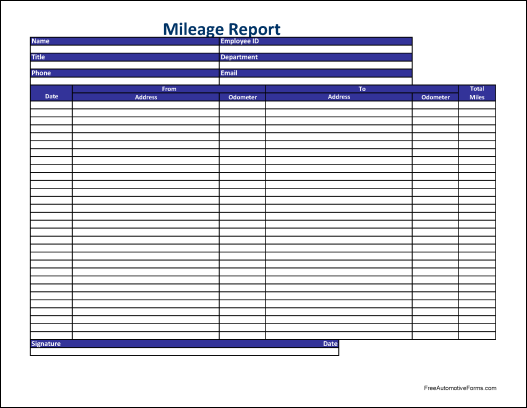 FreeAutomotiveForms' free "Mileage Report" form is associated with the following keywords: mileage log, miles, odometer, car, auto.